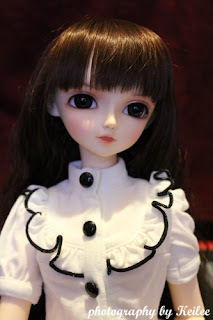 Last month I posted a blog called Goodbye Soo about how Delf "Soo" was being discontinued, along with the other Delfs, and how I debated getting her but ultimately decided not to. At the last minute, some friends helped convince me not to give up on the last chance to get a doll that I wanted. So, I ordered her on November 15th - which was not only the last day to order any of the Delfs, but also the first day of the Luts Winter Event. Her body is only single-jointed, but she stands and poses well anyway. Her head cap is held on with the S hook rather than magnets, which isn't great but maybe I'll mod it and add magnets in sooner or later (been thinking about doing that for all of my dolls that don't have magnets in their heads). Other than those minor things, she's a wonderful doll. I'm glad I made the decision to get her before she was unavailable.